Today’s the day that Facebook makes their big press push for their Facebook Connect service, which was first announced last May. The NY Times has a story giving a broad overview of Connect as well as competing services from MySpace (Data Availability) and Google (Friend Connect). All three services are platforms for third party sites (Digg, Twitter, Citisearch, CBS, whatever) to let users sign in via their favorite social network instead of the normal approach. Some profile information flows with the sign in, which the sites can keep for a period of time. And activity that occurs on the site – Twitters written, Digg stories voted on, restaurant reviews on Citysearch, etc.) can optionally flow back to the user’s activity stream. What the third party sites get out of these services: easy sign in for users, particularly new users. They can also use the profile data to help users create accounts at their site with little data input. The activity stream information published on the social networks includes links back to their sites. And one of the most interesting features, for Facebook Connect partners: sites can request friend lists from Facebook to help them make more connections on their own services. 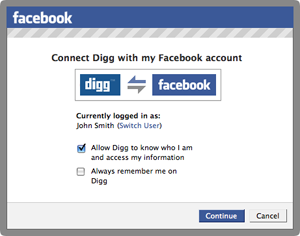 Digg CEO Jay Adelson recently gushed over the potential of Facebook Connect for his service. Facebook also gives Connect partners most of the same tools as their application developers to promote their services via the news feed, invites, etc. But the real value goes to the social networks. These services make users begin to think about their identity in terms of their MySpace profile, or Facebook login as they use it to sign into their favorite services. That makes it even more likely the users will maintain their profiles on those services, add friends, etc. MySpace in particular wants to own user identities. Their MySpace profile is their name online, which is why they’ve embraced OpenID so completely in recent months. Data Availability and OpenID are two parts to a single strategy. Facebook is probably less concerned with identity – there is no branded URL for users, for example. But they do want to own the definitive profile for an individual and, more importantly, their social graph. Knowing who you are and who your friends are is the key to their yet-unrealized business model. And the biggest win of all is this free flow of data back to the social networks, which quite nicely fills out a user’s profile for advertising purposes. Facebook is moving ahead alone with Connect, using proprietary standards for login and data sharing. They’ve also prohibited Google from trying to get in the middle of things with their Friend Connect service. MySpace, by contrast, is using mostly open standards in their approach, and is working closely with Google to make sure the services work properly together. The battle for partners is intense. MySpace announced Twitter as a launch partner, but rumor is that Twitter is actually integrating with Facebook first (there’s no reason they can’t offer both, and they probably will). MySpace also announced Yahoo and eBay as launch partners. To date, though, they’ve only launched with Flixster and Eventful.